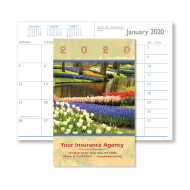 The Mines Press collection of promotional diaries and planners has everything your business needs to run a long-lasting brand awareness campaign. Our diaries and planners are available in appointment, daily, weekly, and monthly formats and are complemented by multiple finishing options and extra features. All to help you find the right product for your company's promotional goals and for your customers' needs. 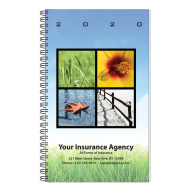 Promotional planners and diaries are, in essence, organizational tools. Technology has come a long way, but cell phones and tablets are still only one "bug" away from crashing or running out of battery, which could lead you to miss an important meeting or to lose significant information. 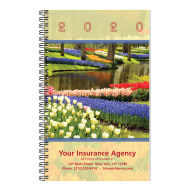 If you use imprinted planners and diaries for your next marketing campaign, you will be making sure that your customers, clients and even your own employees, will never forget an appointment or important meeting again, while keeping precious information secure and available at all times. In other words, you’re going to be giving out practical, useful, and appreciated promotional materials that people will be happy to have, with your name on the front cover. Order your promo planners and diaries today!